It may be largely more of the same, but Sonar X3 is the best version of Cakewalk's absurdly powerful, well-stocked DAW yet. Comping is fantastic. Nomad Factory effects are awesome. Melodyne Essential is included... ...and beautifully integrated. Track colours at last! VST3 support. Interface can be overly busy. The announcement last month that Gibson had acquired Cakewalk came as something of a surprise, as did the fact that all professional Cakewalk products would henceforth be released under the Tascam Professional Software brand. Yet none of this double-breasted-big-businessery had any effect at all on the developer's seemingly written-in-stone release schedule - if it's autumn, there's a new Sonar around the corner. 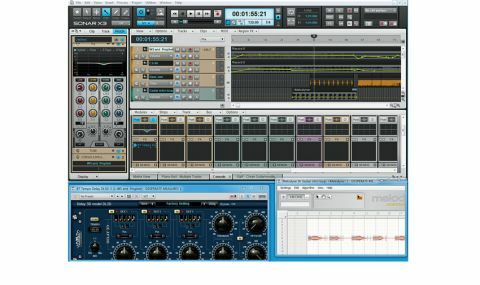 "Version X3, however, sees both performance and interface changes and throws in what might be their best selection of new tools in years"
Recent versions of its PC-only DAW have seen Cakewalk focusing on the interface and stability, rather than making sweeping changes or bundling in third-party goodies. Version X3, however, sees both performance and interface changes and throws in what might be their best selection of new tools in years. We're reviewing the Producer Edition here, but it's worth mentioning that all three versions of Sonar X3 (X3, X3 Studio and X3 Producer) have the same basic feature set, including unlimited tracks, 64-bit processing, ReWire, and VST3 support. The main differences lie in the bundled effects and instruments, with the cheapest bundle also lacking ProChannel and Audio Snap features. Sonar X3 looks better than ever, thanks to the ability to individually assign colours to tracks. In addition to looking very nice, this also serves a practical purpose, allowing you to immediately identify specific tracks or track types at a glance - a real time-saver when dealing with complex mixes. Better still, tracks can be made to automatically match the colour of the buss to which they're assigned, with their associated channel strip automatically following them. Other than a few minor tweaks, the interface remains essentially unchanged. Veteran Sonar users will have no trouble getting around. Still, the odd adjustment can be found here and there with a bit of digging. For example, there's now a Comping tool hiding under the Edit tool, tying in with X3's new Comping functions. "Now you can use the Comping tool to select any segment of a take, instantly splitting out the clip and promoting it to audible status"
Yes, Sonar has always had takes and comping, but X3 takes the concept to a whole new level. Multiple takes are still expandable from the track header, but now you can use the Comping tool to select any segment of a take, instantly splitting out the clip and promoting it to audible status, and even applying crossfades between its adjacent clips. This makes it a breeze to quickly audition segments of multiple takes to create the perfect track. It's one of our favourite new features. As suggested, the Producer Edition of Sonar X3 includes a fair few bundled goodies this time around. This is, of course, in addition to the vast list of effects and synths in previous versions. Instruments are represented by a modeled guitar in the form of Applied Acoustic Systems' Strum Acoustic Edition (as sold for $99), and a modeled electric piano, Lounge Lizard Session (worth $99). AAS are known for excellent physical modeling, and these both sound fantastic, as does the full version of XLN Audio's sample-based Addictive Drums (worth €180), which - very impressively - is also included. The array of new effects, however, is even more tempting. First, there's the QuadCurve EQ Zoom: a beautifully outfitted EQ with an awesome display that opens out of the ProChannel view. ProChannel also now features a Tape Emulator module - with Cakewalk having delivered tape sims since the old Pro Audio days, you'd expect its new Tape Emulator to sound the business, and it does, imparting a warm, vintage vibe. Then there's Tone2's BiFilter2 (worth $39) and the killer Blue Tubes FX Studio Mixing Suite (worth $399) from Nomad Factory. With no fewer than 19 valve-mimicking effects, your retro lust is sure to be sated by this lot. Delay, chorus, phaser, dynamics and more are here, and they sound fantastic, each and every one, despite their considerable age. It should be noted that Sonar X3 bumps its VST hosting up to version 3. With more and more developers ditching VST2.4 and developing VST exclusively in VST3 format, this is good news. VST handling itself is now slightly different, too, with VST scanning optionally handled in the background. So no more waiting while your plugin collection is scanned before getting down to business. The path from your studio to the world at large has grown very short. Social media sites have infiltrated every aspect of our lives (and most DAWs), so it's no surprise to find them written into Sonar as well. Sonar X3 adds to its existing SoundCloud support, letting you upload songs as YouTube videos right from the control bar. You may also be tempted to take advantage of the free 5GB of cloud storage made available by the inclusion of Gobbler, enabling you to store, back up and share your projects. Sonar has always been a superb package, particularly in its Producer Edition, and we've given it high marks with every review. Yet this version represents an exponential improvement over the previous one, with better performance (it feels noticeably smoother and snappier throughout), sensible GUI tweaks, new features that are actually useful and, of course, that killer bundle of instruments and effects. If we have one quibble, it's that, although the interface is largely user-definable, it can seem crowded at times, making a very strong case for running it with multiple monitors. Nevertheless, there's little to not like here. Sonar X3 gives you everything you might need to make quality, professional recordings at a very good price.